Extend your living space with a solid patio cover from Ultra Patios of Las Vegas, and enjoy your home from a fresh perspective. With the addition of a patio cover, you can maximize your existing property and extend your usable square footage while getting relief from the hot Vegas summers. Ultra Patios proudly serves the entire Las Vegas Valley. We are a family-owned and operated business, licensed, bonded and insured to ensure the quality and professional service you deserve. 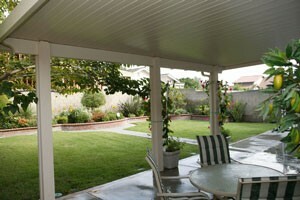 A solid patio cover is the seamless extension of your roofline that is built to cover a portion of your outdoor space. With this extension, you can convert part of your “yard” to “living space”, giving more options for daily use and entertaining. Ultra Patios can build a patio that matches or compliments your home, creating a retreat that will protect you and your loved ones from the elements for years to come. Depending on your needs, Ultra Patios can customize your patio to include ceiling fans, low-voltage lights, optic lights, post lights, and more. With a solid patio cover, you can enjoy the outdoors regardless of the hot sun or pouring rain. You can unwind in the fresh air after a long day, and entertain in confidence knowing that your patio structure has you covered – literally! Additionally, the reduction in UV rays and other elements translates into extending the life of your patio furniture. We offer design versatility that gives a custom look that is complimentary to your home. Not only will your new covered patio add personal value, but it will also increase the monetary value of your property because it effectively increases your square footage. Since it’s covered, the patio structure can help reduce energy costs; by reducing the heat retained and absorbed by your home, you’ll be less reliant on air-conditioning to cool the inside. At Ultra Patios, we put our 35 years of experience to work so you can enjoy the best in covered patios. Our Alumawood and Elitewood aluminum patio covers are embossed with a beautiful texture that resembles the beauty of real wood grain. This material is crafted from American-made aluminum that doesn’t chalk or fade and comes with a limited lifetime warranty. Our solid patio covers are virtually maintenance free and are completely weather resistant. If you’re tired of grilling under the scorching sun or shuttering up indoors due to excessive heat or unexpected rain, give Ultra Patios a call today to discuss putting our expertise to work for you.